UFC superstar Conor McGregor talks with Sports Illustrated's Jon Wertheim about fighting for his homeland, moving up in weightclass and much more. Saturday night in Las Vegas, the Conor McGregor World Tour plays a Big Room yet again. The UFC’s hottest act gets back in the Octagon, less than three months after winning the featherweight belt. Then again, when you fulfill your prediction, as McGregor did, and win your fight in mere seconds—13, to be precise—a long lay-off isn't in order. In the main event of UFC 196, McGregor will take on Nick Diaz at 170 pounds. While it’s not the lightweight championship fight that was originally scheduled and McGregor’s bid to become to the first duel weight champion in UFC history—whenever this guy fights, it’s an event. Jon Wertheim: Broad question to start, but what's it like to be you these days? 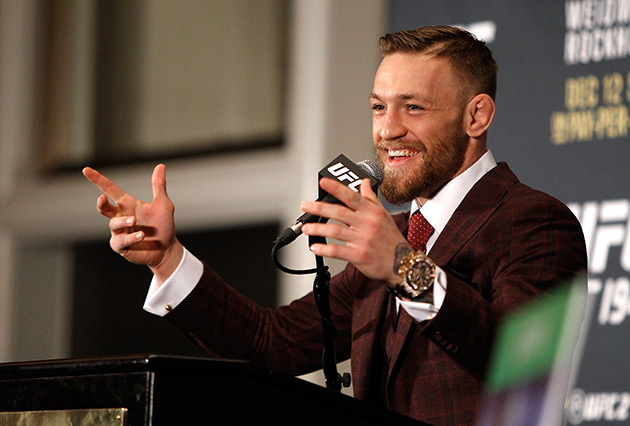 Conor McGregor: What it's like to be me? You know, it's good to be me. My life is good. I'm living good. I'm eating pretty good these days. As you see, I walk the streets, and everyone is full of support and praise and looking to take pictures and sign things. It's very proud for me to have the support of my people. So it's good to be me. CM: Yeah, 100%. The more you seek the uncomfortable, the more you will become comfortable. I always put myself out there. I'm not afraid to commit to something. People, they see things in their mind, they have a picture of what they feel will happen, but they keep it quiet in the hope that maybe it just will happen. I feel that's a fear, and that's a fear that will make that come up short. I am not afraid of saying something and going and pursuing it. That's it. I see it in my mind. I say it out loud. I go and do it. JW: What some people call trash talk, to you that's truth? CM: Yeah, trash talk, again, it's an American term. I don't really understand it. I see a shot. I see how my opponent defends himself. I see how he attacks. I see how he retreats, how he moves forward. I recognize what I have in my locker that will connect clean on his chin, and that is it. I let him know. I let the world know. Then I put it in a timeframe. Then I go out and do it. JW: What does being from Ireland inspire in a young fighter? You know, we are built tough. We come up tough. We are raised to fight. What is the best feeling in fighting? CM: The first collision I think is the best feeling. You know, when there's no restrictions, the shins are bare, the feet are bare, the gloves are small. It's as pure as you can get it in a combat situation. It's legal. It's clean. It's a very highly competitive sport. There's so much adrenaline. The forced exchange means a hell of a lot in combat. For me, that first collision where there's no one to say, 'Go soft,' there's nobody holding you back, it's just go. That for me is a beautiful feeling. JW: You've been outspoken in saying that you want to put your nation on the map. You're very outspoken in saying you want to do this. Why? You know, again, before I came on the scene, there was no Irishman here, you know. The UFC is the pinnacle, like the World Cup, the number one promotion, the number one company in true fighting. I looked around and saw we had great representatives in boxing. We had great representatives in kickboxing. We had some talented Olympic champions in kickboxing, even in boxing. In true fighting, fighting as a whole in its purest legal form, we weren't even on the map. There was not one of us in there. So I set out to be that person, to be the first, to be the best, and to lead the way for my country, to educate my country on what true fighting is. Because now everyone knows what true fighting is. Now everyone knows that fighting isn't just as simple as it looks. It's a lot more complex. There's a lot more to it. But just as early as two years ago, nobody really knew that, so... I set out to do it and I done it. JW: Was there ever a moment maybe earlier in your career or before that when you knew you had the ability to be great? Is there something you can pinpoint? CM: I think anybody that really focuses on an obsession and allows it to take over every aspect of their life will succeed in that particular obsession. I just figured out that that was what will happen. So if I gave my all into this game, if I put everything into the fight business, then I would eventually rule the fight business. That's where we are right now. CM: You know, I could have chosen an easy contest. I could have stayed in the division. But really what else is there to do? I have beaten everyone in the 145-pound division. Jose was the longest reigning champion. He is the only champion in the 145-pound division. He was the pound-for-pound No. 1 on the roster. He had beaten everybody. I had beaten everybody. Then I beat him in 13 seconds. There's no one really there just yet. I'd like to see a couple of them throw down and look to build that interest back up again. That's what I should feel with the featherweight division personally. I feel they should compete now. There should be no sitting and waiting and begging for me to come and say, I'll give you a fight. He must work. True champions, they fight, compete and they work. CM: No. I mean, I don't really have time to think about something that would scare me. I simply show up and I work and I keep positive. That's it.